Last Sunday was my third Pedal PGH, the local advocacy group’s big city ride. The forecast indicated a 30 percent chance of rain, and the radar showed several incoming thunderstorms crossing from Ohio into Western PA. I lingered indecisive, but eventually set out to ride. Although I started 45 minutes late, that didn’t present any problem, and the rain I feared never materialized, as my route somehow danced around the downpours that happened in various parts of the city. But with heavy overcast, there wasn’t much point in taking any photos. Being a populist ride, the crowd included a high proportion of neophytes who presented a danger to themselves and others, and I rolled past three or four major crashes attended by ambulances and large crowds. I felt safest on the parts of the longest route that was reserved for the strongest riders, although Pedal PGH is notorious for having the routes re-integrate, repeatedly putting the faster riders at the back of the pack of obliviously weaving, stopping, and dangerous tourists. Then add in the stupidity of scheduling the ride during the local university’s move-in week, which threw even more clueless parents and students onto unfamiliar streets, both on foot, in cars, and piloting rental moving vans. 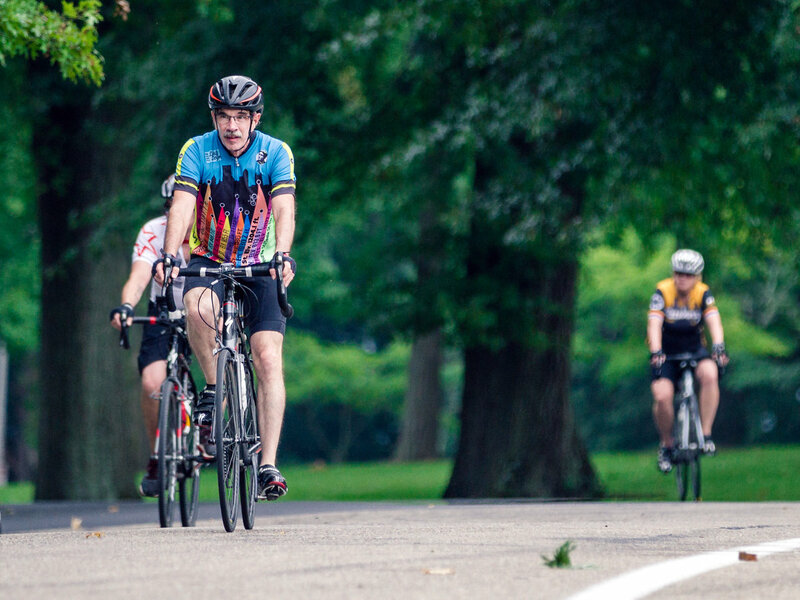 Pedal PGH is more of an obstacle course than a fun family or group ride. The longer metric century (62-mile) route is challenging, with about 4,000 feet of steep climbing. Between time off for travel, record-setting rainfall, and overall lack of mojo, I’m way behind my normal fitness level, so I was pretty wiped by the time I finished. However, I still wanted to repeat last year’s followup: riding down the (blessedly flat) GAP trail to McKeesport and back, which would bring my day to 100 miles, my fifth full century of the year. That was a stupid, stupid idea. If you believe Strava’s pathetically misguided “Relative Effort” metric, it wound up being the most difficult ride I’ve ever done. But I toodled along and took frequent rest stops, invoking the powers of Fererro Rocher and Coca-Cola. One of my stops was at the bike rental place at the Waterfront, where I had a nice chat with the guy there. It wasn’t a bad day out, but given my lower fitness level it was definitely a stretch.